I would like to take you back to October 2018. We were gearing up for exams, it was a tough time. My morale was as low as my bank balance, and I had a weird addiction to yogurt raisins. And so, like the post-apocalyptic fresh hell that appears in my nightmares, Auckland Transport decided this was the perfect time to rip the rug right out from under me and change every. single. bus. in. Auckland. Now here’s the part where I admit that I’m a North Shore gal with very little patience and a very big barrier between me and the UoA campus; Waitemata harbour. I don’t like sitting on a bus for 55 minutes every day, but when you’ve tried to drive the Harbour bridge in peak-hour traffic, only to realise you took the wrong turn off and find yourself heading west, buses become more appealing. And yes, that’s happened a few more times than I’d like to admit. And unless you’ve got connections with a free carpark in the city (I envy you), or cash to literally flush down the toilet, parking at uni isn’t a reasonable option either. So busing it is. And that was fine; I managed, it was easy peasy lemon tag-on-tag-off squeezy. Until it wasn’t. I like to consider myself an expert on buses to and from the shore. I knew the 879, 839 and Northern Express like the back of my hand, but I deserve a distinguished service medal for my loyalty to the 881. It was my dear friend. It was there for me at my best times, and more importantly at my worst times. When my car got stuck in the mud at the station parking, for instance. When I was running late for assignment hand-ins. When I’d had a couple too many jugs at Shads and needed my bed and some snacks. It came on time and never failed me. I would know exactly when it would come. I would know it’s peak times and it’s quiet times. Whether it would be a fresh double-decker with USB ports, or a slightly-smelly old one near retirement. But most importantly, I would know exactly how long I could leave until I left the house, and still make it in time. Until I didn’t, until I got a glossy pamphlet in my letterbox and my world changed. The pamphlet detailed the Rubix cube that was the new bus system. It promised to deliver a simple, more frequent and better connected public transport network. To me, it looked like a rainbow crashed from the sky, wrapped in and around itself and randomly landed on a map of Auckland. I had hope at first. Maybe they just made a few additions, a few minor tweaks. Maybe I would have more bus options! Maybe it’ll make our journeys quicker! Cheaper! Better for all! But alas, like every time I’ve been ghosted out of nowhere, my hopes rapidly faded. Where was my beloved 881? Nowhere to be found! And Northern Express? You’ve been cloned and multiplied! And why does the bus now stop just as it gets to the top of Symonds Street? I was outraged. The 881 used to drive the whole way up Anzac Ave to Symonds Street. I used to get off at Anzac Ave and with a hop, skip and a jump, I would be at my 8am law tutorial. But those days were long behind me. Now I would have to make the agonising walk down the length of Symonds Street. That’s basically Ninety-Mile beach in road form. I can’t even walk properly before 9am! So, if you’re about to write me off as a whiney millennial, and tell me to stop complaining and do something about it. You bet I did. I’m not one to keep quiet, it’s got me in some trouble at school, but proves to be quite handy when there’s an issue. I already know I’m going to be one of those old ladies who complains about everything to everyone and I can’t wait. But back to the issue at hand – my world crumbling down around me in the form of an impossible new transport network. So I call Auckland Transport. I call numerous times. 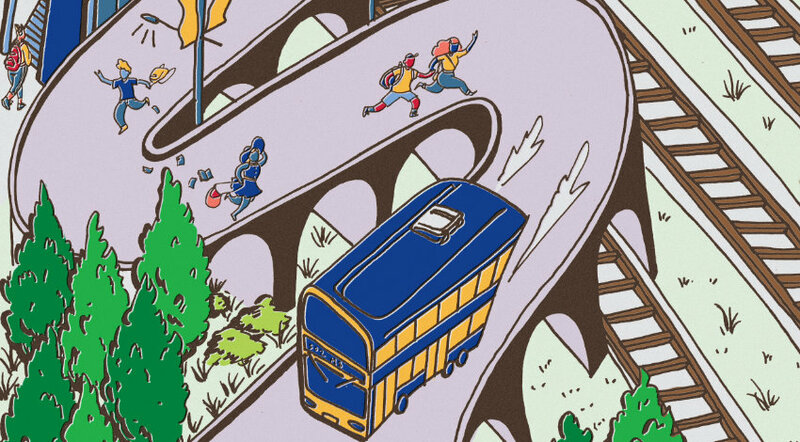 The first time, I was told that the 881 bus was not being cancelled; the buses in the glossy pamphlet were just additions, and the 881 would still be in the network. I even got her to pinky swear! The other phone calls occurred when I realised I had been told LIES and every bus had changed. No 881 in sight. So my stress rash came back and so did my anger. It’s hard when you live in a modern day society where you get told your opinion is very important every time you ring to complain, because you stupidly start to believe it. The other phone calls confirmed that the convenient system I had grown to love had been replaced with a network that would force me to walk up through Albert park or all the way down to Britomart after my evening lectures. I told myself this was not the time to advocate for women’s safety, and then promptly told myself to scratch that, because there is always time to advocate for women’s safety. Auckland Transport should be providing a safe and supportive bus service for everyone. So it’s hard to deny that for me, as a gal slightly afraid of the dark when I’m alone, I don’t want to be walking miles on my own every night to catch the only bus that would get me home. Call me melodramatic, I call it being vigilant. My new frenemies on the other end of the phone had obviously heard this all before and had tapped out. They told me the best thing to do would be to email the complaints department. So that’s what I did. Unfortunately, this is where I admitted defeat. The standard apology email I received included the usual rhetoric of ‘your opinion is important to us’ and ‘we value your feedback’. But there was no solution. I realised, like grandparents with a new iPhone, the times had changed and I just needed to keep up. Sadly, in this instance, I couldn’t change the world. And so the day arrives and the new bus network begins. I stay in bed, for my own sanity. I considered it safer. Stressed students, a new bus network and an already busy traffic morning… It’s a no from me. And it turned out I was correct. News articles began sweeping in of bus gridlocks, congestion and utter chaos. Yes, some of this can come down to first day jitters, but I knew this bus system would not bode well when I began seeing posts of my fellow students finding out they now have to take three buses to get to uni. I mean, that should be illegal. My equally pained friend has found herself in a dead zone, lost in the void of the new network. She’s now adding onto her already heinous student loan by moving out of home because the new bus network is so appalling. It would take her 2 hours to get into uni and 2 hours to get home every day, and I don’t think anyone has that kind of time. So where does that leave me? The new year has brought a new semester and fresh hope; my bank account looks a bit healthier, as well as my eating habits, and I begin my new life with the new bus network. It’s doable, I’m learning to accept the change and embrace the extra steps and new route. But like an ex-boyfriend, I can’t help but think about the love story that was myself and the 881. I miss you already. I will never forget you. Thank you for your service. And if you’re also struggling with the new network; kia kaha, it’s a bumpy ride.